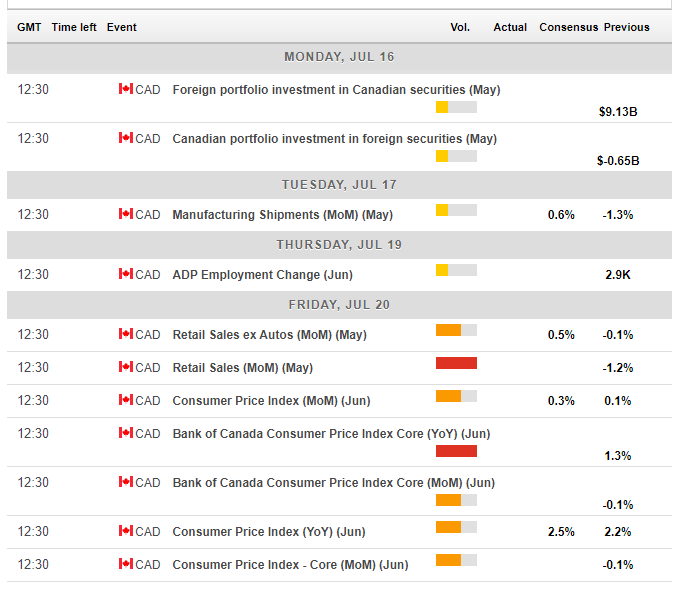 The Canadian Dollar was unable to rally on the hawkish BOC hike. A double-feature Friday and also trade are watched. The technical picture is mixed after a few weeks of see-saws while the FX Poll shows a bullish bias. The Bank of Canada raised interest rates from 1.25% to 1.50% as was broadly expected. However, some had projected a "dovish hike," a signal that the Ottawa-based institution will signal a pause in rate increases. That did not happen. The final paragraph of the statement maintained the hawkish bias, saying that further hikes may be needed. On the other hand, the BOC mentioned trade no less than four times in the short document, talking about concerns among businesses and describing protectionism as the biggest threat to global growth. Governor Stephen Poloz clarified that the Bank only takes decisions based on things that happened and not on speculation on further developments. The Canadian Dollar initially advanced but then retreated. There have been no developments regarding trade between the US and Canada. NAFTA talks will have to wait for August, the earliest. However, Canada's neighbor readied tariffs worth $200 billion on China and also clashed with European countries over defense spending. The hostility towards trade adversely impacted the loonie and other commodity currencies. The US Dollar had other reasons to rise as well. US core inflation accelerated to 2.3%, and Fed Chair Jerome Powell said he "sleeps well at night" regarding the condition of the US economy. The week commences with lightweight events such as the flow of investments and manufacturing shipments. The ADP Employment figure for June is published after the official jobs report which showed a jump in job gains but a slowdown in wage growth. The best is kept for last with a simultaneous publication of the inflation and retail sales. While headline inflation is above 2%, core inflation slowed down to 1.3% in May. The figures for June may show the same trend that was also evident elsewhere. Higher oil prices boost prices, but slow-moving wages strain core prices. Nevertheless, we may see the effect of the US tariffs begin to impact prices to the upside. Retail sales badly disappointed in the report for April, with a fall of 1.2% on the headline. The upcoming report for May, deep in the spring, may show a bounce in consumption. For a meaningful move in the USD/CAD, both reports would need to go in the same direction: either beating expectations or falling short. However, even if they contradict each other, high volatility is likely. Here is the Canadian calendar for this week. The week begins with the all-important Retail Sales report for June. The report for May came out better than expected and sent the USD higher. The US economy is all about consumption, making the event a high-volatility publication. On the same day, Russian President Vladimir Putin will meet President Trump in Helsinki. The presidents will likely discuss security, Syria, Ukraine, and many other topics. Any improvement in bilateral relations may have a modest positive impact on the Canadian Dollar, on a risk-on atmosphere. A combative meeting may result in a risk-off atmosphere that may hurt the loonie. However, it is important to note that Russia is not a significant player on the world stage so that the impact may be minimal. Fed Chair Jerome Powell will testify on Tuesday and on Wednesday in front of committees of both chambers of Congress. The prepared remarks, released on Tuesday, will likely have the broadest impact on markets. Powell was recently upbeat on the economy, especially on jobs, but also more confident on inflation. On the other hand, he said concerns about trade are growing. Markets will want to hear how significant are these concerns and about the path of rate hikes. Later in the week, US Industrial Output is expected to rise after a fall last time. Wednesday's housing figures are projected to remain at high levels. However, it is important to note that a significant impact is only likely if both Housing Starts and Building Permits go in the same direction. 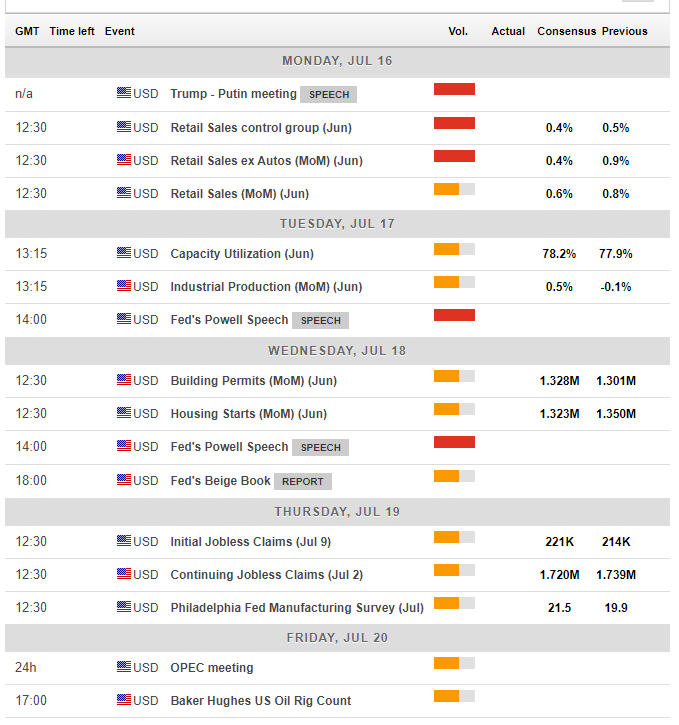 Thursday's Philly Fed Manufacturing Index will be watched more closely than usual after a considerable drop last month. The broad picture is mixed. The Relative Strength Index is near balanced on the daily chart and Momentum is slightly negative. However, the pair is trading above the 50-day and 200-day Simple Moving Averages. Looking up, 1.3220 was the peak on July 12th. It is closely followed by 1.3260 which served as support when the pair traded on higher ground in late June. The June 28th top of 1.3350 is another resistance line and defends the 2018 peak of 1.3380. On the downside, we find the June 29th low of 1.3130, followed by the all-important 1.3070 level which worked as support in early July and as resistance in early June. Below the round number of 1.3000, we find support at 1.2950 which was support back in mid-June. The Canadian Dollar remains vulnerable to trade relations with the US as it heavily relies on its southern neighbor. The slide in oil prices continues weighing on the loonie, and the BOC's message was not that hawkish. Unless the data provide a superb surprise, it is hard to see the C$ make any gains. 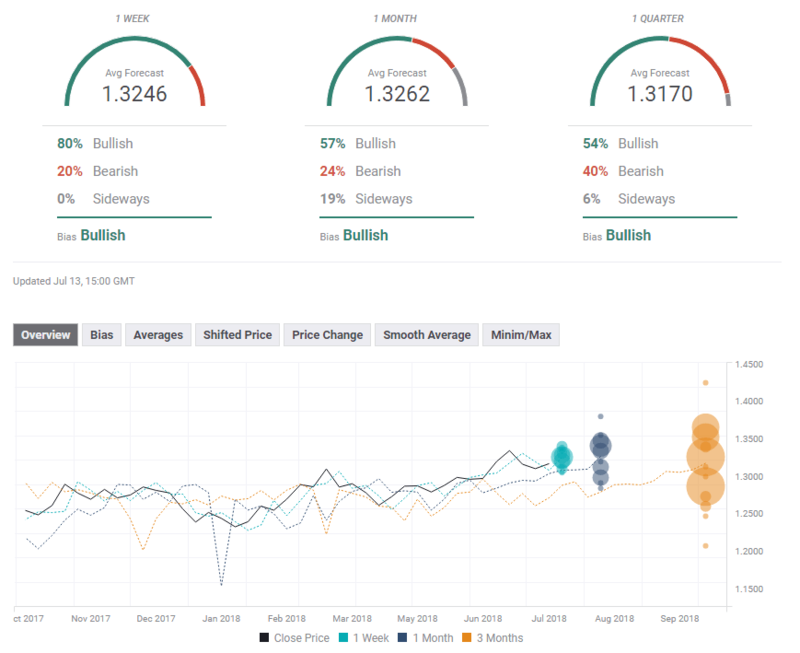 The FXStreet forex poll of experts shows that the trend is bullish in the short, medium, and long terms. In addition, in line with the opinions expressed above. In addition, there has been a small upgrade in expectations for the medium term.